1. The cardholder or card holder's nominee will get upto Rs. 5.00Lacs in case of death or upto Rs. 2.5Lacs in case of permanent disability due to accident subject to terms and condition of the Scheme. 2. Swadeshi Nishtha Sahyog will be provided only if the cardholder has purchased a minimum of Rs. 6000/- in last 180 days from the date of the accident. 3. Cardholder Military/Paramilitary and Police personnel died during any terrorism incidence will also be covered in the definition of an accident for the purpose of financial assistance under the scheme. 4. 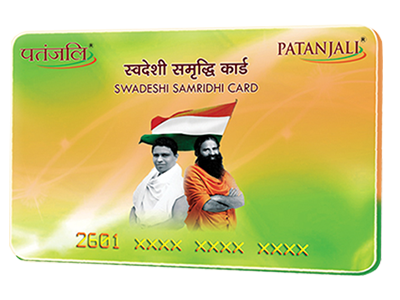 For activation of the card, the user has to visit the nearest Patanjali Mega Store, Arogya Kendra or Patanjali Chikitsalye to activate the card. 5. Patanjali will announce about the particular date for the disbursement of financial assistance on his official website on the Quarterly/Half yearly basis. Patanjali online shopping site is now accepting Swadeshi Samriddhi Card Online. ThankYou Patanjali! Nice service provided by Patanjali with some online features. I got 7% immediate cashback on 10,000 Recharge. Very Nice. useful for regular patanjali shoppers 5% discount , digital money . bonus insurance .